The Prado National Museum (Museo Nacional del Prado) dates back almost 200 years has been described as a museum of painters not of paintings. 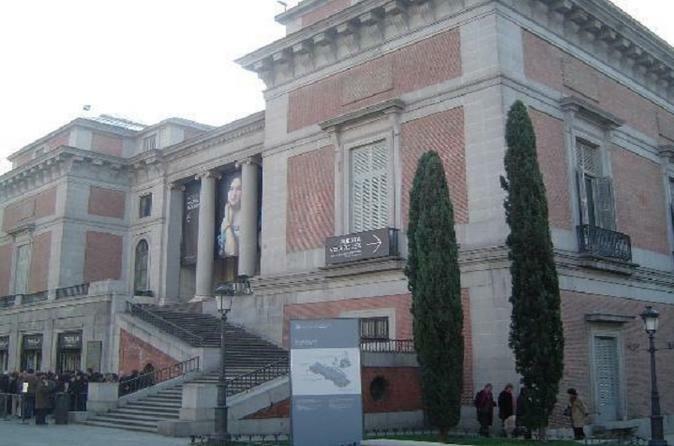 The museum features largest holdings of Bosch, Titian, El Greco, Rubens, Velázquez and Goya, some numbering more than 100 works. This admission ticket gets you in to explore at your leisure during museum opening hours. The Prado (Museo Nacional del Prado) and its collections of paintings, drawings, and sculpture reflect the history of Spain, whose waning role on the international stage in the 19th century reduced its appeal for foreign artists. Spanish artists now trained and worked abroad: in Rome at the beginning of the century, and from the mid-century onward in Paris, the new world capital of art. The nationalistic fervor that characterized the entire century, reflected by Spanish artists in canvases celebrating the country’s peoples, landscapes and history, and the Disentailment of ecclesiastical possessions which, when they entered the Prado from the Museo de la Trinidad, significantly enriched the original holdings from the Royal Collection, are all reflected in the Museum’s collections, which terminate in 1881, the year of Picasso’s birth. While primarily oriented towards painting, these collections also include outstanding examples of sculpture, the decorative arts and works on paper, from antiquity to the 19th century. Exchange your admission voucher anytime during museum opening hours.